Much—or it should! Over a half-century ago C. S. Lewis warned that the last step in man’s conquest of nature would mean the conquest of human nature itself. Some people think the moment anticipated by Lewis has arrived. In How We Became Posthuman, Katherine Hayles makes just this case (though not in reference to Lewis). Increasingly the question is not whether we will become posthuman, for posthumanity is already here. Rather, the question is what kind of posthumans we will be. Hayles’s concern focuses on an increasingly significant movement that would use biotechnologies to “perfect” the human condition by eradicating pain and suffering, human limitations, and eventually death. Her worries arose while reading a book. [How We Became Posthuman] began with a roboticist’s dream that struck me as a nightmare. I was reading Hans Moravec’s Mind Children . . . when I happened upon the passage where he argues it will soon be possible to download human consciousness into a computer. Her “nightmare” sprang from Moravec’s vision of human disembodiment—the separation of mind from body. How, I asked myself, was it possible for someone of Moravec’s obvious intelligence to believe that mind could be separated from body? Even assuming such a separation was possible, how could anyone think that consciousness in an entirely different medium would remain unchanged, as if it had no connection with embodiment? Shocked into awareness, I began noticing he was far from alone. Dr. Brent Waters (referenced in the two previous posts here and here) rightly describes the posthuman project as a religious movement. In a very helpful essay entitled “The Future of the Human Species,” he demonstrates that the posthuman vision is “based largely on philosophical or theological precepts about nature, human nature, and human destiny that are derived from what may be described as heretical doctrines.” Nihilism, Pelagianism, and Manicheism are the three dominant characteristics that he discusses. But Dr. Waters’ isn’t content to describe and oppose the posthuman agenda. He explains how three essential Christian doctrines provide a compelling alternative. “The Future of the Human Species” concludes with this wise counsel. As we take our first, tentative steps toward a posthuman future, it is not enough for Christians to be critics only. They must also embody and bear witness to an alternative future, a perfect future which in Christ is already in the present. In this respect, they must insist that technology generally should be developed and used in iconic ways which reveal the ways of the Creator who is the source of all that is good, true, and beautiful. In particular, Christians must strive to recover and preserve medicine as a healing art that discloses Jesus Christ as the true nature and destiny of the human species. Dr. Brent Water’s essay, “The Future of the Human Species,” is available here. 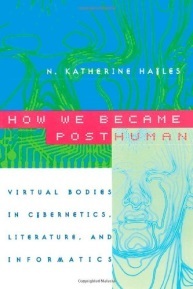 How We Became Posthuman: Virtual Bodies in Cybernetics, Literature, and Informatics by N. Katherine Hayles is available online in pdf here (the entire book). Brent Waters’ books are available online: This Mortal Flesh: Incarnation and Bioethics can be found here. From Human to Posthuman: Christian Theology and Technology in a Postmodern World is available here.